Been there for three nights and enjoyedy stay die the welcoming and heartwarming team. Thanks, really appreciate your taking time to review us. I’m glad you appreciated the hotel staff help! I will pass this on . We are installing a brand new glass lift (elevator) that will extend up to a newly refurbished roof top STORX night spot. Happy to see you back when next in Panama Old City. Perhaps wait until all the construction is completed. The hotel did tell us in advance that the elevators were being refurbished but we didn't expect to have to step around a construction site. The room (No. 1) was very spacious and comfortable with a good kitchenette and the adjoining restaurant served good food. There was no water in the morning, but it did come back - apparently a municipal problem but we were surprised the hotel didn't have water storage tanks. Give it a few months, hopefully this little hotel will blossom. Room tip: Room no 1 had a super little balcony with great views. It was a pleasure to have attended at the time of your registration, they are a very nice couple, it is a pleasure to know about your experience with us. We finished the construction the next month, we hope to see you again. What a disaster! Dirty, stinky, under construction (so not safe at all for the guests), should be closed immediately! Thank you for choosing us Casa Antigua Hotel. We deeply regret the inconvenience caused during your short stay with us and we appreciate your comments to improve this type of detail. We understand the inconvenience caused by the remodeling, we are very satisfied of already being in our final stage of our new elevator and Rooftop. Every day we continue working on the improvement of our services and facilities, since our main objective is to make your stay unforgettable. We hope you continue enjoying your stay in our beautiful Panana. Usually I am fairly generous and may overlook some issues, but in this case, the hallways and rooms were filthy. There was dirt in all the corners. There was a really gross, greasy-looking couch. We ran out of toilet paper. Not a positive experience. Service was also poor. I had a feeling that nobody really cleaned or cared. 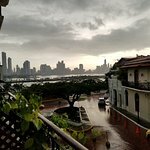 First leg of my first solo trip ever, first time in Panama. The hotel is perfectly located to visit Casco Viejo. They are doing renovations so to accomodate me for the daytime noise they gave me a better room. As I was about during the day none of the noise bothered me. That said, if you are a light sleeper you want a "back" room. No views but the day starts early here, cars like to honk and on a Friday/Saturday night people head out and it can be a bit noisy. I live in a club area downtown in my town so it doesn't bother me but I can see some having a hard time. That said, anywhere in Casco will encounter that problem. Evelyn was an absolute darling, in a genuine way. She's a credit to the hospitality industry and i've been around enough to say she's top of a list for me. The rooms are cleaned daily, a cute coffee maker that looks like an angry penguin. If you like to drink copious amounts of coffee there is Cafe Sucre 1 mini block away. Review to come. There's a full mini kitchen which i only used for beer and water given food is really inexpensive here. Shower only, and temperature control is a little finicky but it was the same in the other 2 hotels so i think it's a Panama thing maybe. No elevators, so you will have to climb stairs to get to your room. But it helps burn off all the yummy food you'll be eating :). Walking distance to the Mercado de Mariscos if you are planning on visiting that as well. AND last but not least there is a bar and restaurant attached so if you don't feel like straying far then it's perfect!! Really a great first experience with the city at this hotel. Safe, clean, hospitable, comfortable. Great place. For me it was a pleasure to have attended to her. Augusta I hope to see you again and I feel comfortable that you liked the room. The worst of it is mostly the fact that they did not inform us of ongoing renovations. The place was filthy. Things thrown all over the place, contractors working full time, water and dirt on the floor. No elevator, had to walk up 5 floors through grim and dirty and smelly staircases. Finally get to the room and it looks and feels disgusting and grimy. Two ladies come in to bring towels which were also filthy. Needless to say, we connected to their wifi and quickly booked another hotel, which was cheaper and with all the basic accomodations that were clearly missing from this hotel. Still working on a refund.